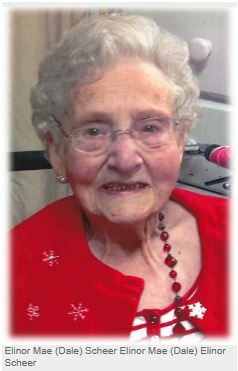 Elinor Mae (Dale) Scheer passed peacefully surrounded by her family on February 7th, 2015. She was 89 years old. She was born in the home of her Grandma Miller in Molalla, OR on December 22nd, 1925 to parents Floyd and Doris Dale. Elinor was the first born followed by four brothers and three sisters. She married her sweetheart, Elmo Austin Scheer on May 23rd, 1945 in San Francisco, CA. They had five children together, three sons and two daughters. They lived in various places around the Portland area and Oregon coast before settling in Hillsboro for the last 40 years. Elinor had many joys in life, from sewing to collecting plates from all 50 states. She was also a great lover of nature, whether she was planting in her garden, watching storms at the beach or walking through the woods teaching all the young ones about the plants. But, her greatest passion was her geneology. She could spend hours pouring over old documents and newspapers. She was always striving to learn more. Elinor was also a proud member of the Daughters of the American Revolution. She will be remembered so dearly to anyone who knew her. Elinor always saw the good in people and it was known that if you needed a mothers love her door was open. it didn't matter if you were family or friend, she was there for you. Elinor was preceded in death by her loving husband of 65 years, Elmo Scheer and beloved son LeRoy Scheer. She is survived by her children Lily Patrick, of Hillsboro, Larry Scheer, of Sisters, Leslie Scheer, of Hillsboro and Linda Mason, of Yamhill, thirteen grandchildren, 22 great grandchildren and three great-great grandchildren, and many nieces, nephews and cousins. A funeral service will be held on Friday February 13th at 11 am at Smyrna Church in Canby, OR. Elinor Mae Scheer, of Hillsboro, was born Dec. 22, 1925, and passed Feb. 7, 2015. She is survived by her children, Lilly Patrick of Hillsboro, Larry Scheer of Sisters, Leslie Scheer of Hillsboro and Linda Mason of Yamhill. Please see www.springerandson.com for the full obituary.